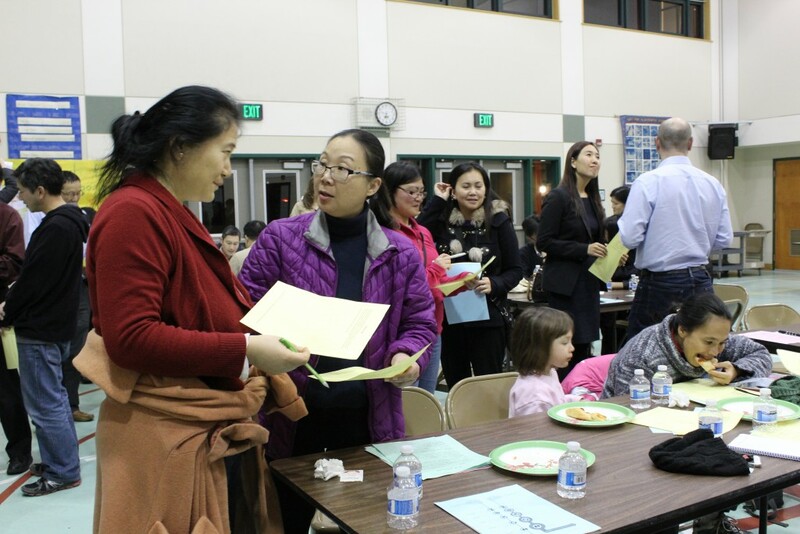 Parents attend math night at Alice Fong Yu Elementary School in San Francisco. Brandy Frakes, an elementary school teacher at the Aspire University Charter School in Modesto, is tackling one of the greatest challenges facing educators: building support among bewildered parents for the Common Core standards being implemented in thousands of California classrooms. As teachers are discovering, a necessary first step is helping parents understand what the standards consist of, and how they are concretely shaping how and what their children are learning. Understanding the Common Core approach to math instruction has been especially challenging for parents, Frakes said. A frequent question she gets from parents is why teaching math based on Common Core standards being implemented in California and 42 other states is a better approach than how their children have been taught in the past. To answer that, she and one of her fellow teachers organized a parents’ math night last fall focused on Common Core at the Aspire campus in Modesto. She had parents sit together in groups and work on the same math problems their children grapple with each day. Common Core supporters say that getting buy-in from parents is essential if the standards are going to have the impact they were intended to have. 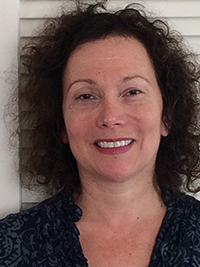 “We all want students to be successful and part of that involves parents understanding and engaging in what happens in the classroom,” said Patty Scripter, vice president of education for the California State PTA. In several states there is significant opposition to the Common Core, but the opposite is the case in California. A spring 2014 Public Policy Institute of California poll showed that nearly three quarters of parents support the Common Core. But the survey also revealed a knowledge gap. Four out of 10 parents said that they had not received any information on the Common Core, and 16 percent said they had received information, but they needed more. The California State PTA has produced a “PTA Parents’ Guide to Student Success” in several languages. County offices of education, such as the one in Orange County, have put together resource guides for parents. Individual school districts have also weighed in with materials like the parent handbook issued by the Santa Monica-Malibu District and the “Understanding Common Core” materials provided by Sanger Unified in the Central Valley. National organizations are also offering parent-friendly resources, including the “parent roadmaps” to the Common Core produced by the Council for Great City Schools. But teachers like Frakes and others around the state feel there is no substitute for having parents experience Common Core math firsthand. Doing so shows parents how Common Core math instruction places an emphasis on getting children to solve problems on their own, rather than relying on a teacher to supply the answer. Students are also expected to be able to explain how they came up with their answers – and to realize that there are often multiple ways to get there. 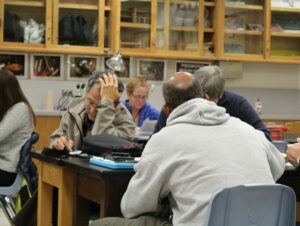 Piedmont Middle School parents attend Common Core math night. 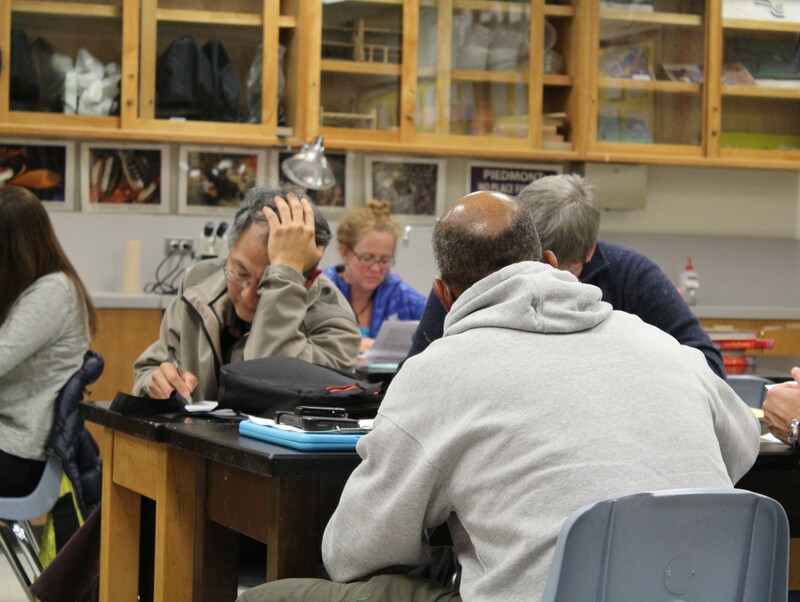 A recent math night led by representatives of the Alameda County Office of Education at Piedmont Middle School drew about 70 parents in this affluent school in the hills abutting the Oakland Unified School District. The parents sat in three different classrooms for 30 minutes each, working in groups to solve samples of problems from 6th- through 8th-grade curriculums, similar to the problems their kids tackle daily. In one group, parents took on a math problem intended to illustrate the concept of “proportional relationships,” which are part of the 8th grade Common Core standards. Parents were given a sheet of paper with a problem that began this way: “Brandon and Madison use different triangles to determine the slope of the line shown below.” Parents were asked to solve the same kind of problem their children will have to solve in the 8th grade – in the space of 15 minutes. Check out page 6 of this Common Core workbook to see the math problem that Piedmont parents were asked to solve. For a Khan Academy online lesson on how to use triangles to determine the slope of a line, go here. Charles Robinson, a parent of a 7th grader, would have liked to have gotten more concrete tools from the evening session to help his son, who he said has struggled with math problems like the one he and other parents had grappled with that night. But Robinson said the session helped convince him that as both teachers and students get accustomed to the Common Core standards, math instruction “will be better in the long run” than in the past. On the other side of the bay, in San Francisco’s Sunset District, Lily Lei, a parent of a 4th grader and a 5th grader at Alice Fong Yu Elementary School, was one of roughly 60 parents who showed up on a weeknight for a Common Core math lesson and pizza in the school’s multipurpose room. Presenters, including former classroom teachers from the San Francisco Unified School District, had parents work out a 4th-grade math problem involving fractions. Parents were asked to consider what happens when a pitcher strikes out 7 out of 18 batters. Was that closer to striking out 1/3 or 1/2 of the batters? Instead of the presenters showing them how to solve the problem, they were encouraged to come up with solutions within their own group, just as their children are asked to do in a typical Common Core math lesson. In those groups, they drew pie charts and number lines and used other visual tools to help figure out the answer. Parents also got tips for how to help their children with their math homework. Lei thought the session was helpful in showing her ways to prompt her kids to break down questions in their math homework. She also said she felt positive about the overall objective of Common Core math to develop critical thinking skills in students. But Lei said she had concerns that Common Core requires children to solve math problems in multiple ways, a task that her children find difficult to do on their own. She worried that her elementary-age children wouldn’t be able to do their math homework independently, without guidance and prompting from her. “That’s why I question if it’s age appropriate,” she said, referring to what the Common Core expects of younger children. To the California State PTA’s Scripter, it’s not surprising that parents are struggling to understand the Common Core. “We are asking them to wrap their heads around tons of information,” she said. Modesto teacher Frakes said that now when parents question the benefits of the Common Core, she has a straightforward response. “I invite them to come into my class and see it for themselves,” she said. School work should be taught and practiced in school where the teachers are equipped to handle questions from the students. 6-7 hours per day, or 35 hours per week is enough time for children to be in the school curriculum. Home time is for family and emotional support. I looked at the 8th grade common core standards for math and didn’t have a problem with them at all. Then again, I took 3 semesters of Calculus, Diff EQ, Partial Diff EQ and Complex variables in college. When it comes to English, put a fork in me. I would probably fail the second grade English test. I don’t even remember what a personal participle is much less a gerund. yet you support Common Core which is a prime example of an egregious sort of implementation as described in your quote above. Regarding the qualifications of people who write standards (or train teachers, or otherwise engage in the field): it is important not to conflate advanced understanding of a topic with knowledge of how to teach it. College professors or industry experts may not know how to break down and explain a topic in a way that children will understand at whatever level is appropriate. Likewise, they may not anticipate the most common misunderstandings or obstacles to learning that will arise among children of a certain age. I’m sorry I can’t come up with the citation for a study that showed that, but I learned about it in a presentation by Pam Grossman at Stanford. The Common Core standards are not dictating how the standards are taught. Experts in a field are likely to know more about what students need to learn to eventually participate in a field. I would anticipate teachers to know more about what the school system is capable of teaching in a given period of time. Hence a partnership would seem fruitful. I strongly suspect that most students can learn more faster than our current school systems are capable of teaching. We just haven’t decided as a society to invest the money in schools to make that happen. It’s even more important not to assume people who know the subject backwards and forwards can’t teach it to a neophyte better than the person who teaches neophytes every day but has weak knowledge of the subject. My best, most memorable teachers were always the ones who best knew the subject backwards and forwards. In the case of the Phil Daro of the eighties and nineties had only a BA in English when appointed to be the lead author of California’s Math standards of 1992, and they were a disaster. Wretched constructivist excess. My son was greeted in the first grade by Mathland in its first year in widespread release and it is difficult to stretch the truth about how bad it was. Our only choice for escape (all the local public schools had switched to it) was the local St.Sensible; by the test they used for diagnostic and placement, the SAT9, he was below average for a 2nd grader. Two years later, after California’s first STAR exam (they also chose the SAT9) half the kids in my son’s Euroamerican, middle class English speaking classroom, were in the bottom quartile at their California Distinguished School, a designation for schools whose administrations drank the CDE Koolaide. Now we are greeted by Phil Daro’s latest big work product as the lead author of the CCSS math standards and, once again, convoluted math lessons supposedly designed to engender a deeper understanding of the subject but tends to do the exact opposite; my own opinion of why that happens has to do with the obscuration of the beauty and simplicity of even the more elementary standard algorithms, not to mention the sort of clear thinking required to make the dreaded “word problems” simple exercises of translation of English into Math. Math as a second language, if you will. Phil Daro’s BA in English wasn’t adequate for him to be chosen as the lead author of math standards in 1992’s California, and it isn’t adequate for him to be chosed to be the lead author of K-12 math standards and college readiness for the whole country in 2015. I would like the governors and the state education bureaucrats who are said to be the ones who drove the CCSS to fruition to step up and tell us how Phil Daro was selected for this position. Personally, I doubt that any governor or state education officer had anything substantive to do with any of it, but let’s ask. The CA Math Standards were anything but “constructivist.” Maybe there’s something to knowing the topic before putting keyboard in gear. BTW, have you “met” Zeev Wurman who frequents this site yet? I believe he had a hand in developing the standards. The title of the earlier California math standards was “MATHEMATICS FRAMEWORK for California Public Schools”, published in 1992. It followed the constructivist NCTM Standards of 1989 and was indeed a thoroughly constructivist document. The California Content Standards that came along in the late ’90’s were the result of the abject failure of programs like Mathland and the effect of whole language learning on literacy and while they did not actually promote one pedagogy over another, the constructivist programs did very poorly when faced with the state STAR exams based on the nationally normed SAT9 diagnostic tests. At my son’s school, which adopted Mathland when he was a fresh faced 1st grader, and supported it wholeheartedly with training thanks to true believers in the district office, half the kids tested into the bottom quartile when the first state STAR test results were released, the summer after his 3rd grade year. By then, my kid was enrolled in the local St.Sensible, far away from the whole math and whole language that was the rage at all the local public schools… at least until the STAR exam scores hit the fan. Most then managed to shed what was obviously not working. The lead author for the California MATHEMATICS FRAMEWORK of ’92 was one Phil Daro, whose only university degree was a BA in English from Cal. The lead author for the Common Core State Standards for mathematics is the same Phil Daro, with a BA in English. Same stuff, different decade. Given your background I am surprised you weren’t aware of it. Like I said, you should go back on this site to explore some of the entries on the new math curriculum and the discussions of the 8th grade algebra requirement. Zeev, I believe, was closely involved in a number of these issues. Go back too, to the UC Berkeley math professor, with no K-12 teaching experience, who almost unilaterally “edited” the math standards at the request of a conservative, back-to-basics, State Board member in the 90s. Mathlands was not a standard, framework, or curriculum, it was a textbook series. I happened to be in a meeting with the SBE member and a bunch of math teachers at the time and they rather angrily asked here where she got off using her pet UC professor to mess up their standards. Her response: “I did it because I’m a Mom.” Now, that would qualify her for a bouquet of flowers on Mother’s Day, but the actual teachers were insistent it did not qualify her to inject herself into the classroom instructional decisions. She was un-phased. What was finally adopted for math was not constructivist and was not developmentally appropriate. Math teacher had to work hard at a triage process to create an instructional lemonade from the lemon standards. The “testing” issue you raise around the time of 1992 and was used to condemn CA’s adoption of meaning based instruction in ELA was based on results of the NAEP scores when CA’s scores indicated it was one of the lowest scoring states participating. Those scores were blamed on meaning based instruction, aka, whole language, which really was constructivist. Neither the ELA standards not the math standards developed during the early ’90s in any way could be described as constructivist. Laundry lists of basic skills is a more accurate description. You could say my perspective was a pretty good one as I was a classroom teacher at the time, actually doing all of this stuff, as well as a middle-school consultant for the CA Literature project that had been in the process of trying to put the professional development in place. Then, of course, after the early nineties the back-tobasics crown threw a grenade into all of that. Another historical anomaly re this issue during the early ’90s Republicans had a majority in the legislature and the governorship at the time and passed legislation re education that was decidedly not constructivist. That’s quite a Gish Gallop you made there, Gary. Of course, I made no claim Mathland (not Mathlands) was the standard. Indeed, it was the #1 curriculum sold in the state conforming to Phil Daro’s Mathematics Framework of 1992, which, as I correctly stated, was the standard. The other curriculums were even worse and all were constructivist in nature. Not a single text (or tub of manipulatives and branded four function calculators) conforming to the Phil Daro standard was worth keeping, not a single school district performed well with them. A disaster. The Content Standard and the textbook review process, in conjunction with the STAR testing, did a decent job of turning things around. And that disaster did precipitate the California Content Standards that even boosters of the CCSS, like the Fordham Institute, agree are better than both the CCSS language and math standards. What did that professor you thought shouldn’t have been allowed to touch the standards do to bring the Content Standards down to a solid A? Specifics, please, not just a implied claim that of course a world class mathematician at the University of Calfiornia shouldn’t have a solid knowledge of elementary mathematics. Perhaps a middle school teacher with a wobbly 480 math SAT should have had that job? In a word, No. California was a constructivist, whole math state starting in 1994/5 when Mathland and the other ’92 Framework conforming programs were first piloted, and then they hit the fan with a mass rollout in 95/96. That’s a fact. My son got both barrels of whole math and whole language as a 1st grader in the Grass Valley School District in 95/96, and one of their larger schools, a charter, remains constructivist. It was also in the 2nd decile in the last 100 Similar Schools report, underperforming still, but they’ve packed the place with upper middle class white kids so they can still point to respectable looking averages. That’s not what Jack Price was saying at the time. The Phil Daro 1992 Frameworks took the constructivist NCTM ’89 Standards and took them farther in that direction. Yes, Republicans had a bare majority in Sacramento a time or two back in those days, but the CDE has been a Dem stronghold for as long as I can remember. When was the last GOP state ed superintendent, and for how long? Not that I care all that much, I’ve never been a Republican. Checking, the last Republican elected to the state superintendent’s office was Max Rafferty (or Slapsy Maxy as my father, a middle school educator, used to call him) so blaming the GOP for actions since about 1971 is specious. Gary, either your memory is going, or …. Then you confound the 1992 Framework/standards (there were no standards per-se in 1992) with the 1997-8 standards. You are kvetching about the 1997 math standards, that what “was finally adopted for math was not constructivist and was not developmentally appropriate,” while Greg was referring to the ultra-constructivist math led by Phil Daro and adopted in 1992. But please do hold your breath … we will have a chance in just a few months to convince ourselves how successful the new constructivist Common Core is with disadvantaged kids and we may talk then about the meaning of inappropriateness again. Let’s remember that the ’97 Content Standard (as opposed to a process standard such as the ’92 Framework and the NCTM ’89 document) was designed not to be constructivist or not constructivist. Just a description of the *content* for each grade so that any student in California would have the chance of spending 12 years in California public schools and graduate with the mathematics knowledge required for success in a math based discipline, graduating with a Bachelors in 4 years. IIRC after ’97, programs were not reviewed for fealty to best traditional practice, only that the content met the standards and, whatever the pedagogy, it was done well. The problem constructivist programs had running the gauntlet was they didn’t manage the needed content and students did poorly on the STARs. The CCSS get through the problems by lowering the bar. You can have less content if you don’t mind kids being 2 years further behind at high school graduation, make the target community college or the least selective 4 year schools and live with kids taking 6 years or more to graduate with a real BS in math, physics, chemistry or engineering. Here’s a report of a key vote back in ’98. Janet Nicholas was perhaps the only traditionalist on the board, but they voted 10-0 to support the editing by Wu that still galls Gary R. Imagine, delaying calculator use until children actually have learned some of the basics… that’s not basics-only, just an acceptance that basics really are basic. Give Gary a break. He was Social Studies teacher after all. You know, history and stuff like that – where a dyed-in-the-wool progressive can really leave a mark. Math just doesn’t lend itself to political proselytizing. Glad you joined the conversation. I recommended that folks reference your comments several times. I am aware that you, with some colleagues at Hoover as I recall, were involved in the development of the math standards. And I agree that my statements did “confound” frameworks and standards. And my timeframes were compressed. It is possibly attributable to my memory, It was a couple of decades ago, but I think it more likely it was perspective. But, yes, frameworks: constructivist… and… standards:behaviorist/direct instruction oriented. It was 1992 (though it could have been 1991) that I attended a NAEP meeting, after the scores seemed to emerge as a media concern, where the caution was offered (and rejected) that state rankings were problematic. I think that’s continued to be NAEP’s position and there have been other peer reviewed papers that support the problems with the state rankings. On the other hand you seem to compress what can be accomplished in implementation of frameworks and their translations into classroom instruction. A math framework adopted in 1992 is not likely to significantly impact instruction or test scores for a number of years, and it’s impossible for 1990. NAEP scores bouncing around in the bottom decile of NAEP from 1990 until 1996 (even) is unlikely to have been impacted by a framework unless the Math Project people, and the much maligned Mr. Daro, were much better funded and more efficient than the Lit Project I worked with. But, again, there’s the perspective thing. You were working on state and then national education policy and I was working in a classroom with real kids and other teachers. There does appear to be a lot more “clarity” when you’re making policy than when you try to implement it. From the classroom perspective it appears that lemon trees are being vigorously shaken in Sacramento and Wash DC and then the lemonade making is all to be accomplished by those in the classroom. Aside from the LAO “CA Report Card” of the time I referenced that discussed NAEP scores in terms of a “two tiered” school system there have been a number of other studies that link scores to a number of factors that were changing in CA around the same time: school funding per child sank below the national average in 1985 and that continued into the 90s (and beyond obviously), poverty in CA was increasing, and the number of second language students exploded in the state in a way that is almost incomparable to other states. Now all I have hanging around my desk is a 2013 article from the San Jose Mercury news on NAEP scores. And CA continues to be near the bottom of the 50 states (coincidentally right where its funding is). Trend lines do seem to be improving though. The article also notes that there are inconsistencies between NAEP results and state results, and correctly asserts this is due to the difference in what is taught and what is tested. But, as far as the NAEP is concerned, there seems to have been little progress between times before standards and after. The National Research Council concluded the same thing about test scores nationally and the national move with NCLB. As a 35 year teacher, Reading Specialist, and ESL teacher i worked with many Latino and Black kids and always found their success to be more than “appropriate.” If your reference to a link was to the one at the “American Principles Project” It was not my impression that was an organization dedicated to the interest of Black, Latino, and other disadvantaged students. At least there are some “media watchcdogs” that suggest that. Gary, you write a lot but say little, so I’ll be brief. The 1992 Framework caused only constructivists textbooks to be adopted in California in 1994 and reject *all* traditional books. CLAS, an expensive constructivist but useless test with zero reliability was given in 92-3 and 93-4 (hello, Smarter-Balanced …. nice to meet you!) so saying that four years later the 1996 California results were still not affected by them is … how shall I say it politely? … not very credible. California had to climb from the bottom of the NAEP barrel in 1996 and now we are 10 places up or so. If you account for the growing Latino students share that you yourself mention, we rise by another few places in adjusted NAEP ranking. Had we started where Massachusetts started, on the high end in the middle of the pack, we might have been close to them by now. But we started at the rock bottom thanks to Phil Daro and his friends. Please do read the APP report. I wrote it and it is full of California data documenting the massive improvement we’ve made. Since 1997 we have more than doubled in-state CSU freshman enrollment from 26K to 51K, while math remediation rate dropped from over 52% to less than 30%. I would have happily published it with the CFT had they offered the opportunity. Still, data is data and refusal to read it because you don’t like APP is a bit foolish. But now the trend has turned, and you’ll shortly see the Common Core results yourself. Algebra enrollment in California middle schools has fallen by tens of percent within two years and those “accelerated” courses that still remain are rapidly becoming devoid of minority and low SES kids. How do you like them Common Core apples, Gary? Finally, reality on the first, but we still have fantasy for the second. The Content Standards included no language whatsoever that favored “behaviorist” models or “direct instruction” pedagogy, and though it was seen in some quarters as something of a gift (to downplay the reations), even Everyday Math passed the review eventually. You seem to claim California was a traditional educator’s paradise before ’92, but the FRAMEWORK was only the final nail in the coffin, for a time, of traditional textbook sales in California. There were constructivist policy documents put out long before ’92 (one I have was dated mid ’80’s but you’ll have to wait a few days for citations, my copy is elsewhere) and it’s clear the teacher mills at the CSU’s had education departments inculcating new teachers with the Romantic fads du jour for years. Progress was slow, but it takes time to wean a large state away from inadequate textbooks and pedagogies (not to mention new teachers who actually think cognitive psychology bolsters the constructivist case) that insure lots of kids will have no chance whatsoever of getting a BS in a math based discipline in anything close to 4 years after high school graduation. If the best you can hope for is being two years behind when graduating from high school, you are out of the true STEM picture and while many white and asian parents will insist on the old pace with a solid algebra in the 8th grade and calculus or a solid precalculus by the 12th, children of color will get the standard substandard education, if they’re lucky. I think a black kid in a poor neighborhood should have the same opportunities as a middle class white kid, not the usual soft bigotry of low expectation claiming high expectations are ‘developmentally inappropriate’, and the record of Bennett-Kew in SoCal proves it can be done, with the right teachers and leadership. CCSS appears to be the same sort of Trojan horse for bad curriculums as the FRAMEWORK was, and if the bandwagon travels in the same speed, the whole country will have lots of ‘parents with pitchforks’ demanding real change by 2016. So I’m curious about the impact this had. In looking at the NAEP results over these years there does not seem to be much anomaly to the slope during that time, and if anything, results have been as flat or flatter since NCLB was enacted (especially looking at subgroup results). Also, is the claim that it is instructional materials that create the residual that is so hard to remove, or is it that students who were brought up in a certain environment go on to become teachers and thus impart some of the same concerning trends? Regardless, I expect pitchforks will be forgone for charter schools. That’s what I meant, Zeev, by pointing out the differences in perspectives between those who work on “policies” in Sacramento or Wash DC (or Hoover in particular) and those who implement policies via providing professional development, working at schools, or working in classrooms. Using the well worn “ship metaphor,” the school system in CA of over 1000 districts and around 400K teachers does not turn easily or quickly. I will say the various content area projects did what they could to provide professional development on the frameworks but it was scratching the surface only. I will also say that the professional development efforts for implementing the standards were even scantier. And adopting textbooks doesn’t really do too much. It’s what you do in the classroom with the textbooks that counts. On the ELA side I know of many verifiable stories of administrators having the old skills-based textbooks removed from teachers’ classrooms and leaving a pile of cartons of chapter books. The teacher was just told to go forth and “implement” literature based instruction when they returned to school. Few school site leaders were well acquainted with the new strategies and could not provide leadership. The exception here would likely be secondary schools that had been using literature based instruction for decades. You know, all those novels you had to read and respond to in high school and, perhaps, jr. hi. So, it all may not seem very “credible” from your perspective, but to people actually doing the instruction in the classrooms it was all too real. We know very well today that the old one day drive-by “professional development” is no way to implement changes in classroom instruction. It takes highly trained mentors working with teachers at sites over an extended period of time to create change. We got that partially with the frameworks. almost not at all with the standards, and it remains to be seen what will happen with CCSS. Your reference to “standards,” threw me. Should not have, but did. And, yes, the underlying principles of test/standards driven instruction are behaviorist. The sad truth that’s being missed is that the lead author of the “whole math” Mathematics Frameworks for California Public Schools, adopted in 1992, that gave us the whole math meltdown of the mid ’90’s, was one Phil Daro, whose only degree was a BA in English. That we have many of the same sorts of bizarre ways to do simple math in the curriculums said to conform to the brand spanking new “Common Core State Standards” two decades later has a lot to do with the fact that the very same Phil Daro (BA Engish) was the lead author of the CCSS mathematics standards. The CCSS Math programs are just whole math, part doh! It’s back, only this time it’s nationwide, and Achieve, unlike the constructivists in California two decades ago, is in control of the assessments of students and of their teachers. As described in the New Yorker, some of the kerfuffle on the Common Core (though not in California), after comedian Louis C.K. criticized it. “In several of his tweets, C.K. blasted the Common Core, the federally approved (but not nationally mandated) standards that most states, including New York, have adopted. Parental critiques of Common Core math problems have gone viral before. At the same time, defenders of the Common Core have argued that the standards themselves are not the problem so much as the poorly conceived or badly expressed curricula in which they are often embedded. This defense sounds reasonable enough, though parents whose children come home with worksheets presenting obscurely worded or illogically presented problems and bearing the words Common Core can hardly be blamed for conflating the two. “Some observers, among them Arne Duncan, the Education Secretary, have been quick to dismiss parental critiques of education policy as whining. Duncan may have apologized for sneering about “white suburban moms” who find that after exposure to the Common Core “their child isn’t as brilliant as they thought they were,” but that he expressed the thought in the first place is telling. It’s easy to make fun of privileged parents who can see no fault in their charmed offspring; one can even imagine Louis C.K. doing it. What impact is intended? I assume the answer is more students will do better in math. However, the more proficient and advanced students did fine in the past and will do fine in the future. It’s the underperformers that need to get a big benefit from CCSS oriented curriculum, instructional practice and updated pedagogy in general. The problem is that these are the students with the least likelihood of getting parental buy-in. Of course, to the extent they do that’s a benefit, but I see no reason why parents who didn’t help their kids in the past will do so under CCSS – the point being that if the educrats are relying on greater parental buy-in rather than in-school efforts, they are setting up a lot of students to not receive the intended impact. Though I hate to do it, I will respond briefly to you, Floyd. I’m not sure what sort of answer you seek though it sounded to me as though you were suggesting that Caroline and I should rewrite the standards ourselves if we don’t agree with them. I have already said it a zillion times so I doubt one more time will make a difference but…. I am against national standards of any kind. That said, you are in favor of national standards of any kind. You don’t put any stock whatsoever in the quality of those standards due to the fact that you are hell bent on the idea of nationalizes and standardized education. I’m not going to get into my reasoning as I’ve said it all before and you don’t genuinely listen to what people have to say anyways. Don, if you are against any national standards why not say that? The way you criticize it, it sounds like if they did certain things differently you would support them. I do think national standards are inevitable given that virtually every politician who may be President any time soon supports them (Hilary Clinton, Biden, Jeb, Mitt, Warren Since it is inevitable, why not be constructive and fix what we have? Unless you expect Rand to get elected, these standards are here to stay, so why not try to mend it rather than end it, which won’t happen,realistically? Floyd, I highly recommend that you read Ze’ev’s excellent paper linked at the end of his comment and currently at the bottom of the thread. You could actually learn something if you keep an open mind, though that isn’t usually the modus operandi of the ideologue. I had to laugh when you said “if you are against any national standards why not say that?” I don’t care if you don’t read my comments, but please don’t use your failure to do so as a reason to fault me, though that actually comes with a little kudos. My comment above should in no way be construed to imply that I support CCSS, which I don’t. Not only am I opposed to any national standards at all as I’ve said repeatedly, but my understanding of CCSS is that overall it is not an improvement from the former CA standards and likely a few steps back, as many much more knowledgeable on the specifics than I have concluded. Ravitch, with whom I sometimes and even often disagree points out that CCSS Is entirely untested and has been perpetrated on virtually the entire nation in what amounts down to an experiment that could, if failed, set back public education for years. I’m not going to bet the farm on a new seed stock that never once sprouted. I think it’s kind of weird and fascinating that there’s all this angst about getting parental buy-in on Common Core standards and generally informing parents on Common Core. We never seemed to do this with any of the previously adopted standards or curricula. What does it say about the Common Core that supporters are pushing for more parental buy-in when its methodology is so foreign to the math experiences of parents? There’s never been as much pushback with a new curriculum as with Common Core-based ones and so there’s more effort to flex CCSS PR muscle for fear it will go up in smoke otherwise. To parents whose argument is that “I don’t understand this, and it’s not the way I was taught, if it was good enough for me, it should stay the same,” I point out that most Americans (generally including the person I’m talking to) don’t like math and don’t consider themselves expert or comfortable with math. Whether or not the parents can do the homework is not useful feedback. What IS useful feedback is if parents say that their kids are coming home and staring at their homework for hours and not getting it done, and/or that the kids cannot figure out how to solve the problems but are giving it a solid try. That’s the feedback that needs to be respected (and not brushed off by an administrator who says that no doubt the kid spent all that time texting on a cell phone the student doesn’t have). The education bureaucracy in California generally supports the idea that parents are a child’s first and most important teachers. For example see State Board of Education policy #89-01. So just because schools didn’t help parents before is no reason for them not to help parents now. Given all the evidence about how family support matters so much to student education I think it’s good for schools to understand what is happening to their base of support. Especially if that understanding gives them a clue that a change of curriculum is needed. See my comment below. I’ve been surprised a lot of teachers discourage parents of good students from helping them be great. The emphasis seems to be on getting parents of kids who never do homework, only watch TV, never read, study maybe an hour a week if that, to do the average, 5.6 hours a week. By international standards, 5.6 hours a week is extremely lazy for a child 11-18, compared to over 13 in Europe, Asia and Australia and far lower than the average of 18 for a kid who gets into a UC. Teachers often discourage extra work and don’t actively push average parents to be great. I’ve been disappointed by this. If more teachers advised parents to follow the Asian numbers, 15-20 hours studying, work in the Summers, Kumon, under 10 of TV, we could be #1 in education as a nation. Few do. The math curriculum in my children’s school has introduced a number of “didactic” tools for math. One example is proportion webs. First, nobody outside of schools uses proportions webs. Second, this “tool” has introduced a whole set of procedures that are unique to itself. Children have to put the correct representation of a proportion in the correct position. They have to remember to draw the correct lines between the different representations. Plus they have to remember what a proportions web is in the first place. It’s also very likely that parents have never heard of proportions webs before. If one is already proficient in math a web search can clear up the details. I think proportions webs violate two of the goals of the Common Core standards. First, to teach real 21st century skills. Second, to focus on concepts instead of introducing new procedures. Proportions webs are just one example. All the issues referred to in that article are about curriclum not the standard. Zimba tried to make that point, the npr writer chose to play tgat down. But it’s an important one. IMHO, one of the most important aspects of fractions is understanding they represent a proportion that can take multiple written forms. I doubt there is any math standard that doesn’t have that as a goal. Yes, that was my point. It’s the curriculum. Yes again, proportions matter but why add proportions webs when one can write 1/2 = 0.5 = 50%. To be precise the proportions webs are part of the curriculum not the standard. If you really don’t think any California teachers oppose Common Core, get on the California BATS Facebook group. Yes Caroline, but when I’ve asked you and Don if, if they agreed to re-do the features and details of Common Core to have a model for 50 states and tests which would improve education and the work ethic of American kids and parents and knowledge, and international comparisons, from scratch, which would waste several years you guys would agree to serve on the committees and not leave the room until all sides could agree on details or vote on them, and once you came up with a plan back it so we could as a nation unify behind one plan, you and Don have repeatedly said no. So even if they went to the tremendous trouble to re-do all the tests, standards, test-prep materials, teaching methodologies, they would still be criticized by you, Don, many teachers, these ubiquitous negative nelly / Debbie Downer Facebook pages. You and Don have both said you won’t make an effort to be part of creating a better version of the common core to fix the details of which you complain ad nauseum. You are unified and it isn’t heping anyone and isn’t right. That’s why I’m not advocating an entire redux. Sure it isn’t perfect, but I’m not going through all that for the new system to still get all this negative energy. It’s far more important we all unify behind the children as the highest priority! We need to be #1 again! We need to reduce inequality and give everyone a good education. We can’t do that if we waste all the energy we should be using to help children bickering over petty details. I mean, Common Core isn’t perfect. What is? This is just negative energy and is counter-productive. This isn’t helping children. At least not any who weren’t born with a silver spoon in their mouth. I didn’t express an opinion of my own. I pointed out that it’s not hard for Ms. Udesky to find California teachers opposed to Common Core, contrary to what she wrote. My opinion is that reporters should be more thorough. Sorry, Floyd, but your description of the Common Core process is baseless and tendentious. Wrong. I, and many others offered timely — and in retrospect, solid — advice, yet that advice was routinely ignored by the unqualified and inexperienced standard-writers. So now you seem to be happy to rewrite history and blame us — the skeptics — for the gross inadequacies of their sub-par Common Core. A nice effort at jujitsu, Floyd, but no cigar. Standards are not marriage vows, and one can back out of even marriage vows anyway, so please stop quoting sanctimonious rubbish. If the standards are low-level educational gobbledygook — as they are shown to be over and over, by people who actually understand the subject matter — then they should be jettisoned. The upcoming test will likely finally explode them in California as they have been already exploding all around the country. The biggest victims of this pile of academic rubbish are bound to be the weaker and disadvantaged students, and the sooner we get rid of Common Core, the more of them will be saved from academic wilderness. And so, Zeev, while we are on the subject, what were the qualifications of the group that wrote the last set of CA Math Standards? And then, since the standards were unilaterally edited by a UC Math Professor with no K-12 experience at the behest of a conservative SBE board member at the time, of what relevance is it? My experience with teachers form many districts in the state suggest actual classroom teachers thought the Math Standards where very inappropriate developmentally. Many went through an elaborate and time consuming triage process to try and make instructional lemonade from that lemon. Comments from the field (you know here kids and teachers actually do the work of education) suggest many teachers find the CCSS more appropriate, though they do need time to adapt, more quality professional development, ore time to collaborate, and let’s not forget materials. I can respond regarding the qualifications of the California math standards writers (ELA and the rest of the standards were done via a regular process heavily involving teachers), but I suspect you won’t like it. You are right in that those 1997 mathematicians did not have serious K-12 teaching experience, although you may be unaware that a few of them had a lengthy exposure to K-12 education at that time. But that is, truly, only a part of the answer. The full answer is that those 1997 mathematicians were first-class world-renowned mathematicians. The mathematicians that wrote Common Core were second and third class scholars. That’s the sad truth. And the results are telling. Read the short report I cite that contains *data* rather than anecdotes from teachers who “like” or “dislike” a particular set of standards. I am sure you can also quote union reps who believe that the main interest of teacher unions are the kids. The qualifications of Phil Daro, the lead author of the ’92 Math Frameworks that led to the desperate need for the last set of CA Math Standards, was a BA in English with a minor in Math. He’s also the lead author of the Common Core math standards. I minored in History. I suppose had I become a public school teacher I could have managed to teach history for a period or two, but in no stretch of my wildest nightmares would I have had the chuztpah to be the author for national standards for teaching history in K-12. Gary Ravani, let’s not let this thread be left hanging. You were concerned about the qualifications of some standards developers. What about the qualifications of Phil Daro to be the lead author of the California Mathematics Framework in 1992, and to be the lead author of the mathematics portions of the Common Core State Standards now. He had just a BA in English, with a minor in math, at the time. Is that adequate in Gary Ravani’s world to write a K-12 math standard set in stone for all schools in the USA to adopt? In many secondary schools in California, just a minor in math won’t even get you into the department. While it may just be an issue of more pressing matters elsewhere, it does appear the CTA’s Ravani has decided discussing the qualifications of our standards writers wasn’t any fun if it wasn’t in the direction he wanted to see. Let’s look at the history with 20-20 vision. Phil Daro’s 1992 California standards were an absolute disaster, and it took over 5 years to begin to rectify the damage, and arguably, thousands of kids were still being taught by true believers using inferior pedagogies for a good decade or more. It strains credulity past the breaking point to claim *any* of the fiercest critics were invited to join Phil Daro and friends during any of Achieve’s formative stages for Daro Math version 2.0, or to have any real say when it was being steamrollered out. Greg, that quote you are attributing to Gary Ravani is not his. That belongs to the person who goes by the name Floyd. Don, I gave no attribution for that quote, did not intend the reader to take it as a Ravani line and I regret the confusion.